Old Blood Noise Dark Star V2 Review – Best "Pad" Reverb Pedal? Old Blood Noise Dark Star V2 Review – Best “Pad” Reverb Pedal? Though at times all of this effects hullabaloo can seem overwhelming and capricious, there are some givens in the world of music gear, and they usually boil down to very simple concepts: if you want Les Paul tone, buy a Les Paul (or your preferred guitar of choice). For anything beyond that, experimentation is key, and you may not come anywhere near your dream tone until a non-descript aluminum box is perforating your eardrums in a basement somewhere. Ask the guitarist in possession of the offending rectangle where they found it, and they might ramble for hours about this new company they discovered that are making pedals unlike anything they’ve ever heard. It’s happened to me countless times – a night out at a show with some artist friends and suddenly I’m obsessed with a new up-and-coming builder. That exact phenomenon drives the whole guitar pedal industry, and many an incredible company got their start making products specifically for that category of sweaty dude playing power violence in a punk house basement. It doesn’t need to be glamorous to be beautiful. Enter Old Blood Noise Endeavors. OBNE creates their products in line with a sort of basement music bushido, focusing on niche offerings that embody the creative expression found in only the rawest of performing arts. From Reverb to Chorus to Fuzz to Delay, OBNE has not just added their own flavor to classic effects; as pedal-building veterans they’ve plumbed the depths of what’s possible and curated effects that appeal to very specific kinds of players. Each piece is a little different from anything we’ve heard before. In this way, the Dark Star Reverb can relate to its Old Blood brothers. 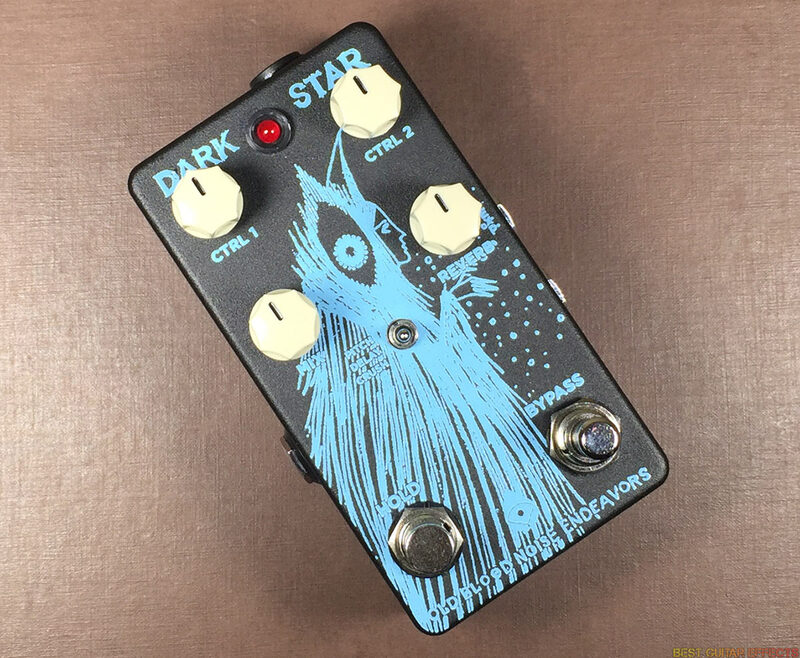 As an exercise in atmosphere, the Dark Star aims to accomplish a wash that many ambient guitarists have expended great energy and up to three spots on their pedalboards to pull off. In this review, we’ll see if it can stand up to that tall order. The Dark Star harbors the balefully fey, baby blue work of Jon Carling on a textured black hammond enclosure. Four knobs direct the effect, a center switch selects the voicing, and two footswitches (one a soft-touch, one a clicking switch,) bypass and hold the effect, respectively. Inside of the enclosure are two controls, one of which is a teensy trim pot that will determine the volume of the effect in relation to your playing; you’ll need a super tiny screwdriver for this one. The other internal control is a switch that determines whether the Reverb release or CTRL 1 is affected by the expression out, and also whether the hold switch maxes CTRL 1 or freezes the last note played momentarily. The way these features interact leaves something to be desired, however: I would have liked to have been able to set the hold foot-switch to freeze the note while the expression modulated CTRL 1, or vice-versa, rather than having them both serve the same purpose. Still, since the effort was made to include expression pedal control for the Dark Star V2 update, we’ll cut ’em some slack as the expression control takes this pedal into a whole new universe of awesome. Visit Old Blood Noise for more info about the Dark Star V2. Before all else, the Dark Star is a relatively simple reverb. But unlike most reverbs, which seek to emulate the space around an instrument, the Dark Star strives to be the hum of the electricity inside the walls housing the instrument, both feeding the music and embodying it. I always try to start my reviews at the top, and at the top of the Dark Star’s voice switch we are cheerily greeted by a polyphonic pitch shifting reverb. The pitch shifting aspect of the effect is in the same vein as most polyphonic pitch shifters, boasting that organ-like bombast we all know and love, but the reverb aspect makes this effect so much more. If you’re aiming for full-wet octave swells to build an ambient loop, here you go. If you want a frozen chord writhing beneath your playing, you got it. CTRL 1 and 2 control separate pitches, which are admittedly difficult to use to dial in perfect intervals, and the tracking on the pitch controls is relatively slow, so you won’t be doing any quick octave-up solos, but that’s not what we’re here for. Just slightly offsetting the pitches and then holding makes for some pretty eerie warbles as the 2-part harmonic dissonance fights itself. Play some minor stuff over this and watch your audience grow uncomfortable. Playing with chords, the Pitch voice actually performed better than I expected when set to produce octaves. In my experience, pitch shifters tend to grow confused and glitchy when presented with any information more complex than simple triads, but the Dark Star handily augmented even full barre chords. I wouldn’t recommend using it this way without seriously cutting the mix back to compensate for how many notes you’ll be cramming into your amp, but otherwise, in terms of its utility as a pad, the Pitch voicing passes with flying colors. This guy sits comfortably in the center of the voicing switch, and is appropriately the kind of effect that’ll make guitarists in the center of the weird/traditional venn diagram very happy. A reverb into a delay creates a smooth drone, the likes of which I’ve been obsessed with since the day I realized I could plug my guitar into something that wasn’t an amp. You can never expect attack clarity from the delay, but the wash beneath the notes blooms organically in response to your picking. Changing CTRL 1 (Delay Time) while playing yielded both interesting pitch bends and digital bubble sounds, the latter of which I’m not usually a huge fan of. In this instance, however, the changing delay address make for curious glitched-out pinging sounds that, with the tastefully slow rise and fall of your expression, can turn out to be blissfully musical compared to the palatal click of some digital delays attempting the same thing. Pair it with another delay for smeared polyrhythmic fun or run another reverb through it for endlessly clear sonic skies, either way this voicing alone makes the Dark Star a perfect companion to any ambient board. My all-time favorite and easily the most expressive voicing on the Dark Star, the Crush patch mixes up gritty, smushed, 8-bit brownie batter with both a bit-rate reducer and a pitch shifter. The combination of these two affect the overall harmonic content of your playing, something I experimented with to create beautifully harsh-sounding overtones. With the mix down low this voicing was surprisingly great coupled with distortion, as it added a distinct flavor of grit to my already clippy riffs. When you change voices, be careful not to leave the Reverb parameter at its highest possible configuration. The Dark Star won’t pick up a frozen note in between voices, leaving you with silence upon flipping the switch. The first time this happened to me I panicked, thinking the Dark Star was broken, but after dialing back the Reverb I couldn’t help laughing in spite of myself when the wash returned. If I’m being true to my dreams, I’d love to see the Dark Star expanded to include a parallel configuration: imagine running and blending any combination of the three Dark Star voices simultaneously, or even just the Delay with either the Pitch or Crush. Even if that never happens, I’m not above buying two or three Dark Stars to emulate it. 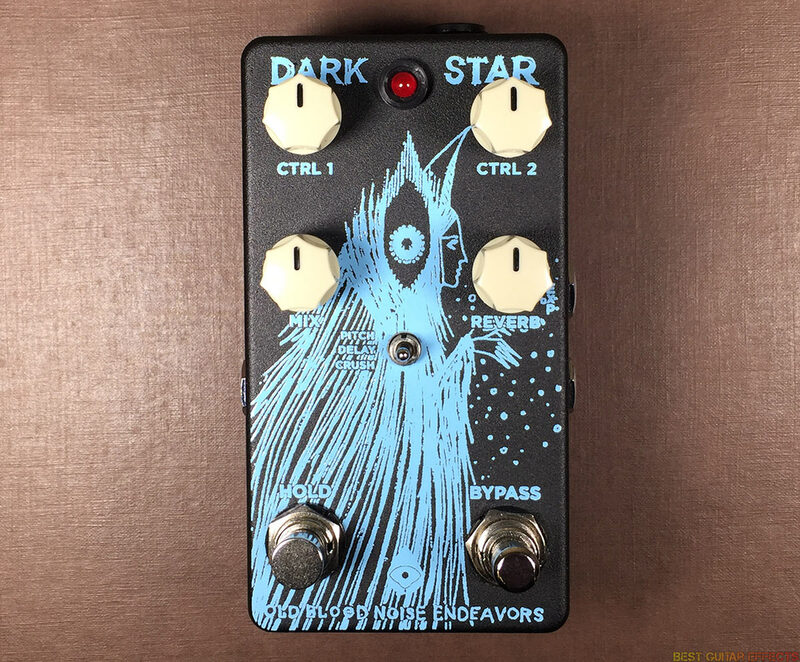 The Old Blood Noise Endeavors Dark Star serves as both a simple means to achieve organic pad reverbs beneath your playing and a powerful sound design tool for enveloping your entire sound in cosmic energy. The Pitch, Delay, & Crush modes offer plenty of ambient reverb possibilities. Despite the minor functionality quirks involving the expression and hold that I mentioned before (just wish the Hold and Exp could be programmed for different functions), I don’t think there was one sound I heard playing with this pedal that was unmusical. The life the Dark Star pours into any riff is songwriting fuel, and if you get the chance to have it in your hands, don’t let go. That concludes our review of the Old Blood Noise Endeavors Dark Star V2. Thanks for reading!